5 Best Holiday Themes | Faddegon's Nursery, Inc.
We’re particularly excited about our holiday themes this year. We think they’re just the best! A very rich blend of metallic colors combined with decorator ribbons in deep bold colors. Designed to enhance an elegant yet warm room setting. We’ve put silver, gold, platinum and coppers together to complement the colors of your home and take them to the holiday. Ornaments and bowl fillers, bows and mantle pieces are all ready for you to incorporate easily into your holiday entertaining plans. Harmonius and tranquil, Seaside is a soft mix of blues, golds, silvers and greens inspired by the ocean. We’ve assembled a beautiful mix of decorations and gifts that soothe the soul. 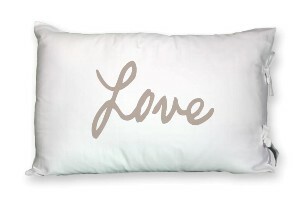 Faceplant pillowcases are one of our favorite additions this year. 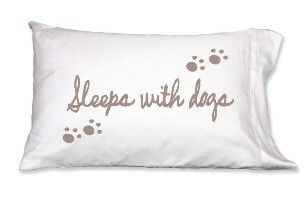 They are printed with playful and inspiring messages such as Mr. & Mrs., Welcome to our Home, and Sleeps with Cats. 300 count cotton means these cases are soft and worthy of anyone on your gift list! Calling all beach lovers! 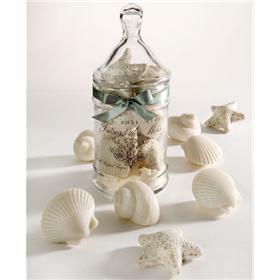 Nine assorted triple milled seashell-shaped soaps, fragranced with White Honeysuckle and Baby Jasmine, fill a classic glass apothecary jar. All of Linnea’s Lights® natural soy candles are meticulously hand-poured in small batches and tested for quality assurance. Every step of the process involves the use of human hands, and each candle is packaged and designed locally in Indiana with recycled or recyclable materials. Our scents are Ocean, Belgian Linen, Hearth and Cashmere. the ultimate gift for someone or yourself. Matchboxes included! For our Naturals theme, we’ve drawn from Nordic design inspiration. The emphasis is on rustic, minimalist elements while not ignoring the warmth of texture. You’ll find browns, ivories and black in our throws, runners and rugs, natural wood accessories, and clean design home items along with driftwood holiday decor. Take a look at our hand painted gourd ornaments too. Want to add some color? No problem! Just add some red berries and you’re done. Like a greeting card from the past. Mercury combines the richest of reds, velvet ribbons and bead trims calling to mind the quintessential early 20th century holiday celebration. We were inspired by red mercury glass ornaments for this theme and are certain you’ll love the look! 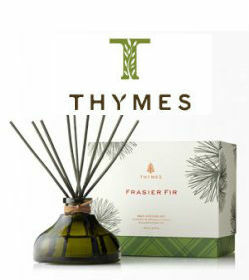 Mercury frames one of our all time favorite holiday items, Frasier Fir Fragrance from The Thymes. Reed diffusers, candles, soap and potpourri are just waiting for you! This is the hands down winner of the holiday scents. The reed diffuser may be the most popular holiday item. Yes! Camp! Remember the days when your family trundled up north for some holiday cabin fun? Recalling hot chocolate, games and family time, our camp theme will fill you with nostalgia. You may not be travelling into the woods for Christmas, but you can bring the great American holiday into your home nevertheless. The BEST stocking stuffers around! Bring home some Authentic American made toys, games and puzzles. Knot tying kits, marbles, jacks and license plate bingo will have everyone you love celebrating together. Meanwhile, serve up some hot cocoa and candy canes from Hammond’s of Denver. They’ve been making their famous treats since 1920 so we thought it was about time we brought some to you! Truly holiday in feel, snow, red ribbons, bells and woodland creatures signal a very merry experience. Chock full of very cozy felt ornaments, flocked decor pieces, and dazzling ribbon, you can deck your halls with cheer this year! Featured are Ditz polar bears, tabletop Santa’s, felted runners and stockings! Don’t forget to take a look at all of our other holiday offerings! 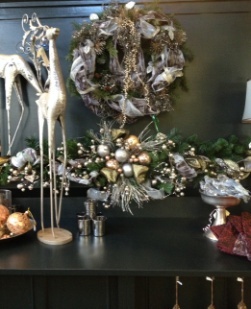 Our trees and greens are well loved in the area, as are our hand decorated wreaths! Highly collectible and always appreciated, we have Old World Ornaments all boxed and ready to go. The Merck Family’s Old World Christmas was founded by Tim and Beth Merck, a couple who shared a special love for Christmas, especially its rich traditions in the European style. The Mercks are credited with revitalizing the art of mouth-blown fine glass ornaments as a result of their reintroducing figural designs to the United States in 1979. Each figural glass ornament produced for The Merck Family’s Old World Christmas is hand crafted in age-old tradition using the same techniques that originated in the 1800’s. Molten glass is mouth-blown into finely carved molds available only to the Merck Family’s Old World Christmas, before a hot solution of liquid silver is poured inside. The ornaments are then hand-painted and glittered in a series of labor-intensive steps to achieve the beautiful creations.